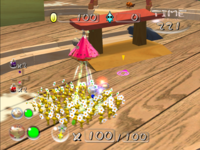 The Lost Toy Box is one of the five levels that will already be available upon unlocking Challenge Mode in Pikmin 2. Olimar and Louie will have the most Pikmin they will ever get in Challenge Mode: 100. It has two sublevels; both contain only enemies of the Bulborb family. It is harder than most of the starting levels in Challenge Mode. It's best to take out all the Dwarf Bulborbs first. Some may spawn very close to the adult Bulborb, so extra care should be taken not to wake it up accidentally during an attack; reloading the map for a better layout is possible. A spray of each kind will make it much less a threat, and there is usually only the need for one more on the next sublevel. This Bulborb will also drop the key. The second sublevel of the Lost Toy Box. 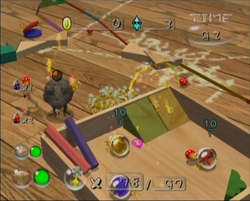 The Dwarf Orange Bulborbs will usually be in the way of the Pikmin carrying the key back, so it's best to take them out first. The larger Orange Bulborb carries the key. Orange Bulborbs wake up faster than Red Bulborbs, so it's best to use the spare sprays here. The treasures are spread widely across the map, even on top of the train tracks, making some scavenging necessary. The geyser will appear once the key is brought back. The geyser must be opened by the Pikmin either by swarming it or throwing Pikmin at it. Blue Pikmin were originally meant to be here, as can be seen in this trailer at 0:50. Spanish (NoA) Caja del Juguete Perdido Lost Toy's Box Given the ambiguity of the English title, it could either be a box that belongs to a lost toy, or a toy box that is lost. The Nintendo of America localization team went with the former. This page was last edited on April 11, 2018, at 20:43.